From Stanford University Press, a new collection of essays, Race and Political Theology, on how the experiences of Jews and African-Americans inform discussions about religion and politics. Vincent W. Lloyd (Syracuse) is the editor. The publisher’s description follows. In this volume, senior scholars come together to explore how Jewish and African American experiences can make us think differently about the nexus of religion and politics, or political theology. Some wrestle with historical figures, such as William Shakespeare, W. E. B. Du Bois, Nazi journalist Wilhelm Stapel, and Austrian historian Otto Brunner. Others ponder what political theology can contribute to contemporary politics, particularly relating to Israel’s complicated religious/racial/national identity and to the religious currents in African American politics. 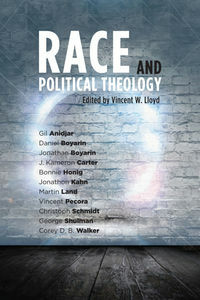 Race and Political Theology opens novel avenues for research in intellectual history, religious studies, political theory, and cultural studies, showing how timely questions about religion and politics must be reframed when race is taken into account.